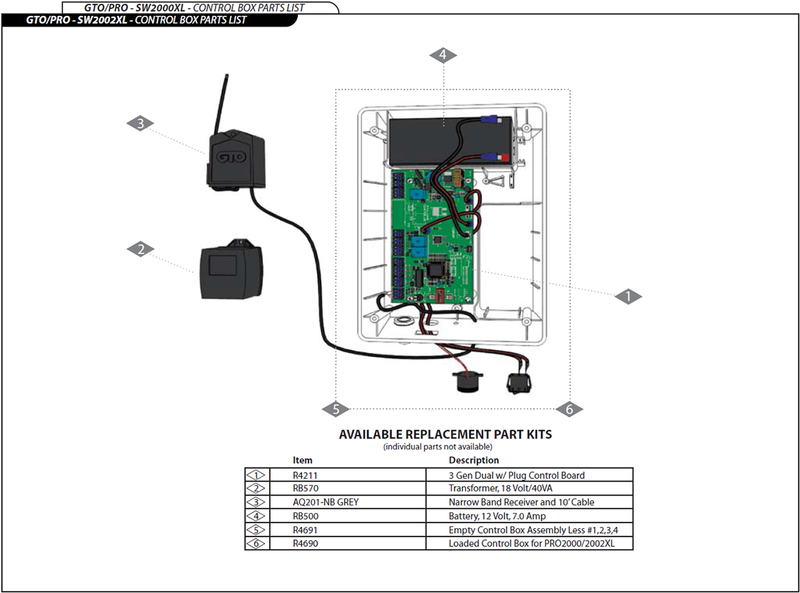 If your GTO / Linear Pro SW2000XL gate opener control box isn't functioning properly, chances are a quick fix is available with a replacement part. At Gate Opener King we wanted to make it as easy as possible for you to find exactly the right SW2000XL control box part you need. In the diagram below, simply select the gray numbered diamond of your desired GTO / Linear Pro replacement part and you will be taken to the corresponding page. Or alternatively select from the list below the diagram. Still not sure what part you need to get your GTO / Linear Pro SW2000XL control box working like new? Help is only a phone call away at (800) 878-7829 or you can contact us through email at Sales@GateOpenerKing.com. Our trained professionals would be happy to offer their knowledge and get your gate opener back on track.